An invitation to any event that stops me spending all of my hard-earned money shopping in the packed-out city centre on a Saturday afternoon is probably worth attending. Especially one that offers food and wine. But the success of the combined Gusto summer menu tasting and Scran on the Tyne‘s first official ‘Scran Social’ pretty much exceeded all of my expectations. A polished and sophisticated Italian restaurant, Gusto is located behind the Pitcher & Piano, next to the Mal, on a plot of prime Newcastle real estate and boasts one of the best and biggest outdoor dining areas in town. Generally I find that if you want to sit outside on a summers day in NCL your options are limited and you will likely have to forfeit either the food or the location. Dining at Gusto on a rare sunny day you won’t have to settle for one or the other, making this spot on the quayside the perfect place to head for on one of those 3 or 4 nice days we get per year. Quelle surprise then that, once I’d arrived and cooled off slightly, our afternoon began with Gusto’s sommelier, Jonny showing us the ropes (vines?) with a little wine-tasting sesh. Now, I’ve ‘tasted’ a fair few wines in my time and can chat rubbish about the various grapes and whatnot with the best of the amateurs, but it was nice to be given a few proper tips. It seemed the charismatic Jonny was the perfect man for the job; knowledgable without being cocky he soon had everyone swirling, sniffing, toasting and guzzling like pros. (Kind of). Wine now flowing, the Gusto waiting team appeared, the food was served and brilliantly it just. kept. coming. The quantity and quality of the dishes caught me by surprise. I thought it would be nice but I wasn’t prepared for such genuinely great flavours. Each dish on the summer menu was gradually brought to the table, beginning with an antipasto selection of meats and cheeses and quickly progressing onto the main dishes. These included such delights as a spicy Tagliatelle Arrabiata, a rich saffron risotto with a white crab salad, some thin and tasty pizzas of various persuasions and a couple of big, flavoursome salads. They were all really good. Seriously. A fresh, well put together menu. You generally know what you’re getting with Italian and it can be difficult to make dishes stand out but Gusto have easily managed this with their menu. The food is clean, interesting and extremely tasty. 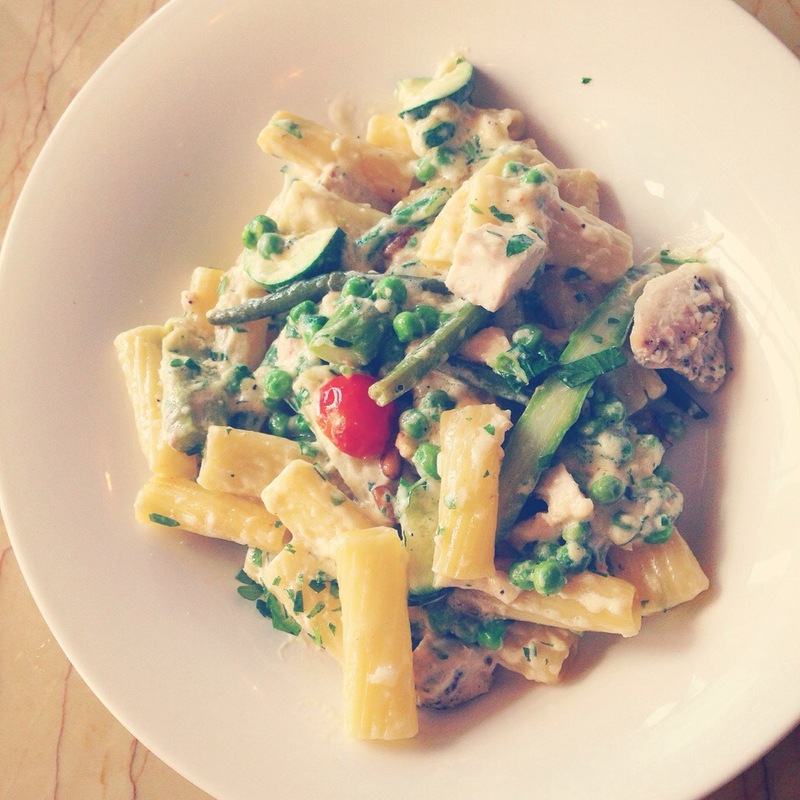 Highlights for me included the Rigatoni Primavera, a light and summery pasta dish involving asparagus spears, peas, fagioli beans, cherry tomatoes, pine nuts, crème fraiche and chicken, and a delicious salad of avocado, asparagus, baby gem and poached egg with a tonnato dressing. It’s a testament to the food that after all that, we still had space for – and finished – dessert. Two desserts in fact. Shared though. Please, we’re not animals. We were served Bombolini, a kind of donut with whipped cream and chocolate sauce, and Italian Mess, a chaos of chewy blueberry meringue, cream and fresh berries and I battled on gallantly until there was not a morsel left. Then all too soon, as it always is with these kind of friendly daytime chats, it was time to leave the Gusto team to clean up and recover from feeding a banquet-full of hungry food writers for a few hours. But don’t worry Gusto; from the looks on everyone’s faces I can practically guarantee you’ll be seeing each and every one of us back again at some point very soon. Major thanks to Miss Lauren Archer for coordinating the event with her usual flair, Jess and Jonny and the rest of Gusto crew for their unrivalled generosity and warm welcome, and the other invitees for the smashing company and wine-fuelled conversation. What more could a girl want?